shellys sewing shrapnel: scrappy log cabin finished! 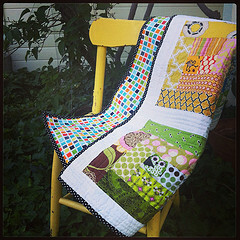 This little quilt that I started a few weeks ago as a scrap buster was so fast and fun. 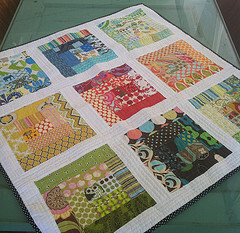 Being able to use scraps and not have to fuss over size allowed me to play with colors and enjoy my block as it grew. Follow Red Pepper Quilts Tutorial to find out how! I found the perfect backing to complement my multi-colored top called Modern by Robin Zingone for Robert Kaufman Fabrics o used black and white polka-dot for the binding. 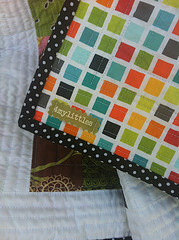 AND.......its up for sale in my re-opened etsy shop, featuring "little quilts"
Looks like a fun, quick project. Oi!! Vim visitar seu blog, amei tido muito lindo parabéns, venha visitar o meu sera um prazer bjsss.